Also, you possibly even know about the big guns in your industry who can boast of thousands of e-mail subscribers who like dumb cows can be milked anytime they want! Statistics say – A smart marketer can make as much as 1$ per subscriber in a month. When you know how important these Email lists are, you should be relying on a good e-mail auto responder to shoulder this enormous responsibility. I recommend GetResponse as the overall marketing solution for small businesses as it boasts undisrupted email deliverability, excellent tracking features, personalized automatic messages, detailed analytics, landing pages, mobile app, image library and much more. A couple of months back, I have weighed against the excellent list building software, GetResponse with MailChimp, and I have concluded that the GetResponse is the flexible software with simple launching options to employ the appealing marketing campaigns. In this post, let me explain the main features of GetResponse that help it to stand out from the crowd. GetResponse – Who? What? Why? GetResponse is the successful marketing tool in the herd of auto responders, but there’s something that makes it different and even way better than its competitors – preferably a lot! Most providers would provide a decent service and would commit to what they say, but GetResponse is dedicated going beyond that. In no other Autoresponder would you find so mind blowing themes and optin forms. You can create them in minutes – without any knowledge of coding. And yes, the creator tool is pretty awesome. Not only the email newsletters and optin forms, but you can also create the dynamic landing pages with GetResponse to enhance your conversion rate. Yes, it has excellent landing page creator tool with web forms and social media integration. To reveal the excellence, I have compared the landing page tool of GetResponse with LeadPages and suggested it for my readers since it has great Analytics support, Autoresponder feature, best-optimized themes and affordable pricing plans. No matter how high is your auto responder regarding features and support, if it doesn’t give your users an attractive design – it will just lead to terrible conversion rates. As a bonus, GetResponse allows you to sneak into the huge database of iStockPhotos and handpick your hot favorites to beautify your newsletters. Even free providers like InInbox have an opt-in form creator, but that’s nothing when compared to GetResponse. Optin-forms and newsletters – both of them are completely responsive and look impressive as well. To improve your conversions, GetResponse provides an A/B testing feature to know which colors and design appeal your audience the most. A/B testing is proved to boost conversions despite being one of the least harnessed facilities. In short, you don’t have to pay for Opt-in form builders like LeadPages or OptinMonster, and even not for statistical insights. Besides these, GetResponse supports Google Analytics Integration, for better insights into your data. Also, it integrates seamlessly with third-party services like PayPal and Facebook. For example, you can add payment buttons in your e-mail and also allow publishing directly to Facebook. Their unique “Track and Analytics” feature lets you monitor the user behavior once you send an e-mail. You can find out who didn’t open your e-mail, and if you want, you can send another tweak message to read your message! This feature bundles a lot of other services that can give you a better understanding of the user behavior. Whenever you’re troubled, you can reach out to their technical support for assistance. Their support team is well versed with the features of this awesome marketing tool and is on their toes to guide you to your success with GetResponse. Forget Google Hangouts! GetResponse comes with a webinar feature in some of its plans. This function is the complete solution of conducting professional webinars. To start with, there are professional templates to send to your audience. Then, you can create the clean landing pages for the webinars with a countdown. You can then send event reminders to make sure your audience attends it with full vigor and enthusiasm. There’s even an auto-login hash that connects your subscribers directly to your voice – no password required! Their Autoresponder 2.0 is a bit more advanced as compared to many of its competitors. You are allowed to send time-based as well as action based messages. To my surprise, you’re even allowed to send personalized “Happy Birthday!” messages. 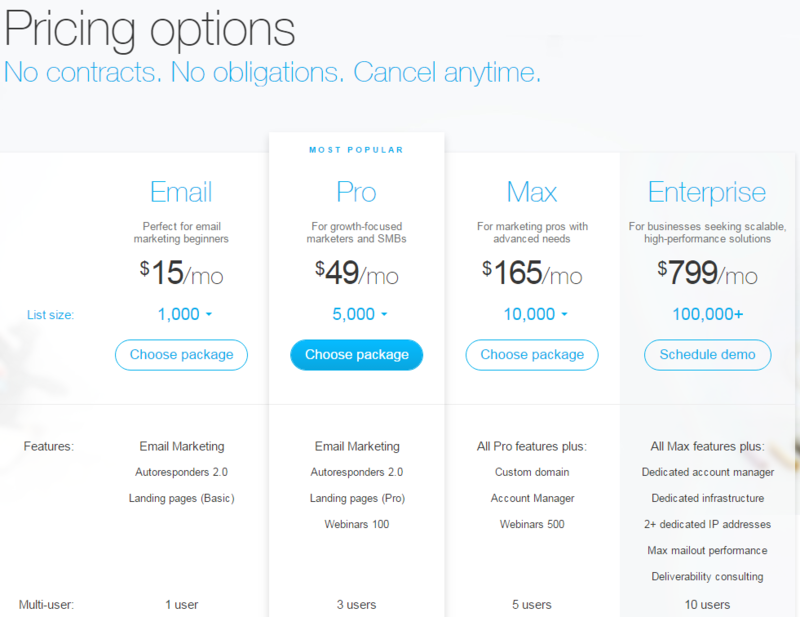 The pricing plans of GetResponse start from $15 for 1000 contacts. However, you may pick up the ideal plan according to your business requirements and try its 30 days free trial with full features without any need of giving your credit card details. E-mail marketing is a powerful tool to get a place in your customer’s inbox. Your message might be lost in the stream of social media, but the e-mails are always authoritative! The complete email marketing tool like GetResponse go a step further with their exclusive features. Their Autoresponder and landing pages are too powerful, and they leave no stone unturned by providing additional features that fill almost every gap that exists. Their landing pages and templates eliminate the need for coding knowledge, and the extra benefits give you better insights of your users. So, what else do you need to build your email list and run winning email marketing campaigns?